Why not save yourself a few calories and choose one of our beautiful cats rather than chocolate this Easter! Cat Protection is the UK's leading cat welfare charity. Devoted to all things feline, we find loving homes for cats in need, promote the benefits of neutering and provide a wealth of cat advice for all. The Stroud Branch will celebrate its 22nd birthday this year. The branch not only covers Stroud itself, but also Stonehouse, Dursley, Painswick, Nailsworth, Wotton Under Edge, Tetbury and the surrounding areas. As a charity, our Stroud Branch relies solely on the generosity and kindness of public donations to enable us to go on caring for local cats and kittens. 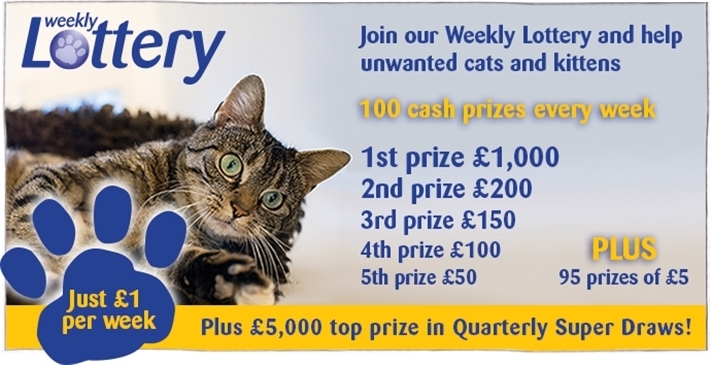 you can support Stroud Branch by selecting us in the donations option when you sign up in person, by telephone - 01628 825 928, online at: http://www.cats.org.uk/get-involved/support-us/lottery or download your lottery form here and Freepost to: RTJY -JUCB-AATE, Cats Protection, PO Box 1127, MAIDENHEAD, SL6 3LN. Don’t forget to select option 3 in the drop down menu online and choose us as your branch to support!